Respect for the dead has proved to be a prevalent notion in most cultures. However, prior to the development of modern Egyptology and the transformation of archaeologists from antiquarians to scientists, desecration of burial sites and dead bodies was not only common, but in the case of Egyptian mummies, used as a form of entertainment. During the late 18th and early 19th centuries, “Egyptomania,” a fascination with ancient Egypt, swept over Europe. While many important discoveries about the Egyptians occurred during this era, wealthy amateur “Egyptologists” and collectors did much damage. Tombs were raided and mummies were sold cheaply to European enthusiasts for a variety of purposes. Best case scenario, the mummy served as a collector’s piece, providing little historical information but also oftentimes avoiding destruction. However, many mummies met a much worse fate. Some were boiled, and the oil produced was sold as a medical ointment. Others were publically unwrapped, both in educational settings and during what have come to be known as mummy unwrapping parties. At these parties, wealthy Victorian Egyptology enthusiasts would unwrap ancient mummies under the guise of science, and often give away the artifacts that were buried with them as party favors. While these parties serve as a rather extreme example, they demonstrate the danger of pseudoarcheology and the lack of respect that many Western nations showed for the human remains of non-European cultures. The first major step towards putting an end to desecration of Egyptian artifacts occurred in 1859, when Auguste Marlette, an Egyptologist, founded the ESA (Egyptian Service for Antiquities), which was designed to protect and preserve valuable pieces of Egyptian history. Since then, more action has been taken by archaeologists, Egyptologists, and the Egyptian government to put a stop to desecration of mummies. These measures ensure that the past is well preserved, but they also raise the issue of respect for human remains. Who has the right to uproot and examine the body of another human being? What level of respect must scientists and archaeologists show towards the remains that they study? Does ethnocentrism play a major role in the amount of respect given to said remains? This issue is prevalent in American archeology as well, concerning remains of Native Americans that are considered sacred by many of their descendants. The problem of desecration is one that must be addressed by archaeologists worldwide. “Egyptian Mummies | Ancient Egyptian Mummy Overview.” Egyptian Mummies | Ancient Egyptian Mummy Overview. N.p., n.d. Web. 27 Oct. 2013. <http://www.kingtutone.com/mummies/overview/>. “Egyptomania.” Wikipedia. Wikimedia Foundation, 24 Aug. 2013. Web. 27 Oct. 2013. <http://en.wikipedia.org/wiki/Egyptomania>. “The Neo-Victorian Parlour.” : Victorian Mummy Unwrapping Parties. N.p., n.d. Web. 27 Oct. 2013. 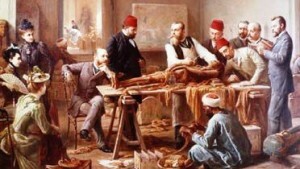 <http://neovictorianparlour.blogspot.com/2013/04/victorian-mummy-unwrapping-parties.html>. “Unwrapping the Mummy  Performance and Science.” Unwrapping the Mummy  Performance and Science. Past Horizons, n.d. Web. 27 Oct. 2013. <http://www.redicecreations.com/article.php?id=22957>. 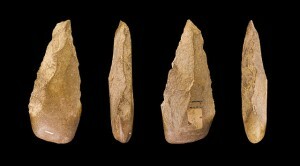 Stone tools are usually associated with cavemen and primitive tribes. The thought of using tools made of rock in a modern setting is laughable to the general public. Yes, technology was not where it is today, but it doesn’t make those populations any less capable than ours. After watching a demonstration of flint knapping by Dr. Lucy Johnson on Monday, it’s obvious there’s a lot more involved in creating a stone tool than anyone would think. Chipping a stone is a science in itself that requires many years of experience and experimentation. It’s not a natural or easy skill to acquire. Each tool with a different purpose requires a different process to create it. The toolmaker must be focused and think about how the other side of the rock will be altered as they take flakes off—a mistake can’t be fixed very easily. The creation of these tools follows the same path of creation for the tools and technology we have today. We create prototypes, test them and make adjustments to make the tool as efficient as possible just like the people using stone tools. When most people think of stone tools they usually limit this category to arrowheads, but really there is a huge variety of stone tools. Each of these tools needs to be made from the right kind of stone to ensure it is effective. This would require some basic geological knowledge—it certainly wasn’t a random choice of rock. These toolmakers would have to find the right kind of stone and know where they could find it. They didn’t just pick rocks up off the ground and begin to use them. These ancient toolmakers deserve more recognition than the modern day public gives them. 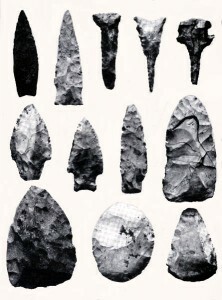 This illustration of stone tools found in Goat Bluff Cave shows the variety of the stone tool category. There are also a lot of ways to shape a rock and with each of these techniques there is a requirement to know how each type of rock will react. The “simple” arrowheads people find and collect are actually very complex. They must be properly balanced and shaped to fit the arrow so that it flies correctly. And multiple arrowheads must be made almost identically so that the shooter knows how the arrow will fly when they let go of the string. This is a much more involved process than the stereotype of hitting two rocks together. Anthropologists at George Washington University study the art of flint knapping. Projectile points also have a lot more to say than modern people think. There are so many variations in the characteristics to study. There are so many reasons a tool could look the way it does due to purpose, culture and environment. To today’s world a stone tool may be insignificant, but to archaeologists they are incredibly important in understanding how people of the past are just like us. There is always a meaning and a story behind these shaped rocks left behind years ago. In thinking about the 2.6 million year history of stone tools, we often discus the ways in which hands shaped stone; but how did the tools they made shape the hands we use today? Not surprisingly, the ability to make stone tools had a huge effect on the anatomy of the human hand. Individuals whose hands were better suited to making tools were better able to hunt and protect themselves; this made them more evolutionarily fit (able to produce more offspring), leading to an eventual proliferation of the genes involved in the better hand formation. 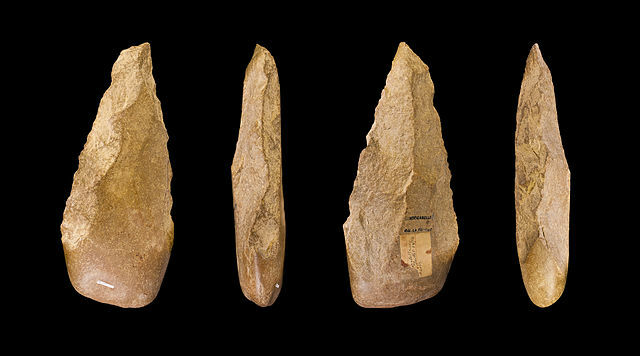 So when stone tools went from simple banged rocks to complex hand-axes around 1.7 million years ago, this reflected not only an intellectual step but a biological one. An artist’s rendition of a member of the species Homo habilis making a tool of the Oldowan type. Before this new technology, the fossil record shows that hominin hands had primitive vestige structures. 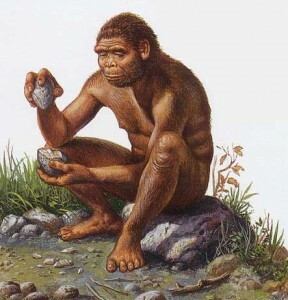 Although Homo habilis (named the “toolmaker” because of the primitive Oldowan tools found in associated strata) had more advanced hands than those of their predecessors the australopithecines, they were not fully modern. Their fingers had a gentle curve like those of the austrolopithicines, and their wrist morphology resembled that of a part-time arboreal species. Despite these primitive traits, the more modern proportions and joint connecting the finger bones to those of the palm allowed Homo habilis to be credited with the invention of stone tools. For a long time, the hand’s evolution from 1.7 million years ago (when Homo erectus first shows up in the fossil record and shortly before Homo habilis disappears from it 1.4 million years ago) to about 800,000 years ago was a mystery to paleoanthropologists. Hominin fossils are a rare find at best, and small finger bones especially are easily broken in the millennia they spend in the soil before being excavated. Stone tools, on the other hand, are much more easily preserved. During this almost 1 million year gap, stone tool technology advanced greatly, enough to warrant a new name – Acheulean industry. But what morphological difference had made this advancement possible? Hand axes of the Acheulean type made and used by the species Homo erectus. A recent discovery has shed some light on this question. In 2010, a team of paleoanthropologists led by Fredrick Kyalo Manthi of the National Museums of Kenya found what appeared to be a finger bone in northern Kenya. It was identified as a third metacarpal, the bone that connects the middle finger to the wrist. Using isotope analysis, it was dated to 1.4 million years ago and attributed to the species Homo erectus. What’s interesting about this bone is the small bump at its base – the styloid – a feature found in modern humans. What seems like a small structural change has huge implications; the styloid helps stabilize the wrist, increasing griping power between the thumb and forefinger. This change was instrumental in the ability to make finer, more precise percussions to the core, resulting in more fine-tuned tools with which Homo erectus became the first multi-continental hominin. None of this would have been possible without the mutual selective pressure between early humanity and its tools. Egyptology is not quit archaeology. It focuses on one culture and their history, culture, language and customs. It however does use many aspects of archaeology, such as scientific excavations and analysis of their culture. Yet it does not do so to improve the future. In popular culture as well as opinion mummies are a large part of Egyptology and many people have had strange fascinations with them now and through out history. In the 19th century European aristocrats would purchase mummies, unwrap, and observe them for their own entertainment. Hundreds of mummies were destroyed during this time. 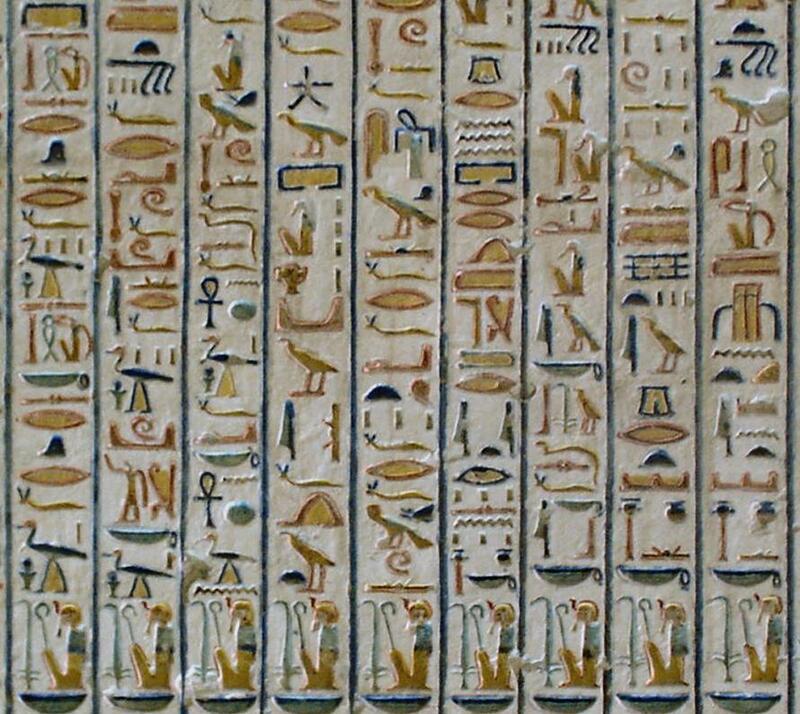 Egyptology focuses on every aspect of the Egyptian culture such as their language and how it was used. This helps them to be able to read the sarcophagus and make a connection to whom the person was and who mthey were related to. For archaeology this doesn’t matter at all. 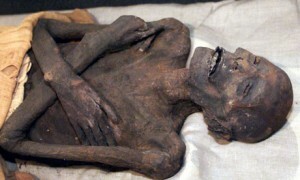 Who cares who this mummies father was or who his grandfather was? Archaeology’s main focus is to gather information that can help our future. Before these mummies were bought and sold to uppity Englishmen so that they could destroy history, many mummies were even lost by people who believed they had some sort of supernatural healing powers, which just throws any thoughts of real academic and information gathering archaeology out of the window. They would grind them into powders for color as well as pharmaceutical use. The furry friends of mummies were also used during this time when mummified cats were processed into fertilizer and used in England. 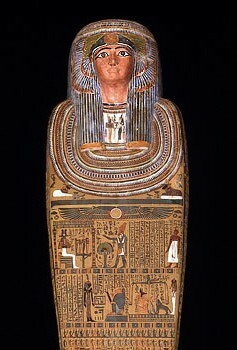 Hieroglyphs cover sarcophagi in order to describe the preserved person within, as well as lead them into the after life. Though there are lots of movies and myths and fascination with mummies we can actually learn valuable information about cultures through their mummification processes. We can see how cultures valued their dead and what they thought of after life and other spiritual beliefs they held. We can see differences between different social classes and the differences in how their dead were buried. We can also learn about the physiology of people from the time and place of these mummies as they can be very well preserved. This is an example of an egyptian sarcophagus showing hieroglyphs as well as a depiction of the persons face. So basically mummies are very cool and when used in the proper way can be very useful for archaeology and not just Egyptology, especially since many cultures throughout history mummified their dead in order to grant them a successful beginning into the after life. 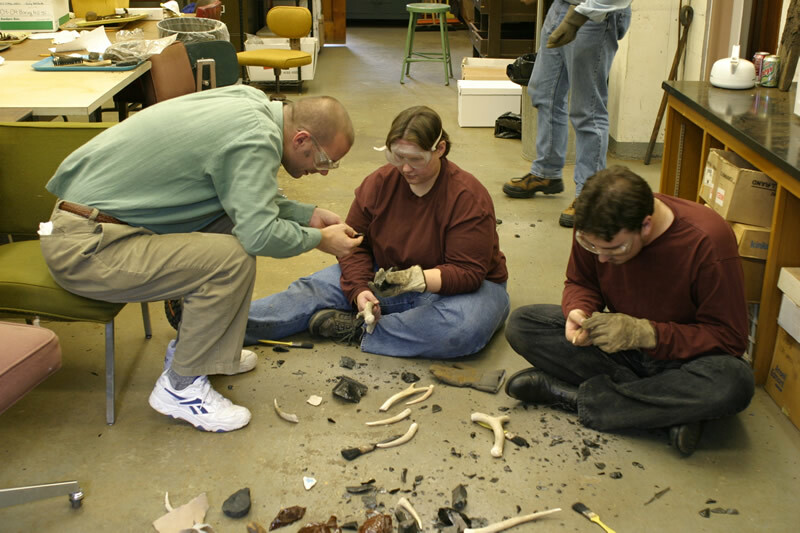 Click to learn things about knapping. “Achitectural Flintwork Courses.” Architectural Flintwork. N.p., n.d. Web. Crabtree, Donald (January 1971). Experiments in Flintworking. Idaho State University Museum. “Firing a Flintlock Pistol.” YouTube. YouTube, 06 June 2013. Web. “Flintknapping – Beginners Part 1.” YouTube. YouTube, 27 Nov. 2009. Web. “Flint Knapping Trade Secrets Vol. 1 – How Ishi Knapped a Slab Part 1.” YouTube. YouTube, 09 July 2010. <http://www.youtube.com/watch?v=z4Ke0YqqXA0>. “Frontier Fire Methods Part 2 Fire By Flintlock.” YouTube. YouTube, 08 Apr. 2013. Web. <http://www.youtube.com/watch?v=glBrQ9WnBGM>. “Harry Oda, Master Flintknapper, Flintknapping Demo (part 1).” YouTube. YouTube, 22 Sept. 2012. <http://www.youtube.com/watch?v=IF7B73rGiW8>. “Knapping.” Wikipedia. Wikimedia Foundation, 16 Oct. 2013. Web. <http://en.wikipedia.org/wiki/Knapping>. “Untitledpercussion Obsidian Blade 0001.” YouTube. YouTube, 18 June 2009. Web.<http://www.youtube.com/watch?v=rSKO0fpES6s>. In this day and age, Christopher Columbus is known by most Americans as the brave and tireless explorer who made the treacherous journey across the Atlantic to discover the New World. It’s a common perception, seeing as how the earliest mentions of the explorer originate in elementary school most often, and paint him as a heroic figure that civilized the Americas. Well, as it would turn out, not only is this view point incredibly wrong, it’s downright insulting to many Native Americans, some of which have actually gone as far as to equate Columbus with Hitler. The issue that is taken against the typically renown explorer is that the Native American people feel that the celebration of Columbus day is in a way a celebration of the mass genocide against their people that the European colonist brought about. Now obviously, this was not the intention of anyone planning the parades or celebrations. However, in the movie Unsettling Columbus Day it is clearly shown that the intentions of one group may come off as offensive to another. Particularly, the apparent embracement of Columbus as a cultural figure in the Italian community upsets the Native Americans, for to them the treatment of Columbus and the explorers that came with him was nothing to be celebrated. For this reason, the Native Americans gather every year to protest the Columbus Day parade in Columbus, Colorado where it was first established. The Native American community is hurt that almost no regard is given to their sentiments on such a day that has a very significant part of their own history behind it. A fair compromise perhaps would be to include the Native peoples in deciding what should be done concerning the day, and involve them more proactively in the archaeological anaylisis of the history of Columbus. This process would take the form of indigenous archaeology. Indigenous archaeology is the form of archaeology in which indigenous people are involved in the excavation and care of the culture and artifacts of their ancestors. By neglecting the Native people’s concerns and their outreach to assist in more fully developing a coherent and correct history of Christopher Columbus for all, one big wave of ignorance is formed in which protesters are seemingly angry with no direction, as seen in the documentary, and parade goers are insulted anyone would ruin their fun. Through indigenous archaeology, the Native Americans can settle the offensive material away from the festive, and establish a more fairly balanced telling of Columbus for even textbooks. Though the movie that was showed for the Unsettling Columbus Day event never directly mentioned archaeology in any capacity, its message no doubt remains in tune with that of indigenous archaeology. The film was a half-hour documentary of sorts. If followed a Native American group in Denver, Colorado as they tried to raise awareness and hopefully put a stop to the Columbus Day parade that was scheduled to happen. While to most white (or at least non-Native American) people featured in the video regarded the holiday as a sort of origin story for their country, the initial event that would in time precipitate both America and their personal families’ history in it, the Native Americans, understandably did not. Rather, they saw it as the event that would eventually result in the subjugation of their people, the displacement from their lands and, most horribly, mass genocide. It’s striking to think of the stark contrast between the two views of this day that come so naturally to these two groups of people. It is no mystery then, how indigenous archaeology relates to these themes being discussed. The central goal of indigenous archaeology is to prevent the such one-sided views from occurring in study of past cultures. Given that fact the Native American population is so small in America compared to other demographics, it is no surprise that they are underrepresented in the field, even when it is their own culture that is being studied. Indigenous archaeology, then, seeks to include members of a culture being studied in the research process so as to prevent the misinterpretations and insensitive practices that can go on without them. This deference to indigenous perspectives shows an attitude of acknowledgement and respect that is sadly denied to the protesters in the film. Though their demonstrations got a bit extreme (at one point, a protester poured a bucket containing fake blood and a baby doll in front of the parade’s path), their being upset is very understandable. As was mentioned in the post-film discussion, Native Americans are often forgotten in the public consciousness as a still existing people, in large part due to the atrocities committed against them that greatly reduced their numbers, paired with the desire of white Americans to forget their immoral, bloody past. Thus, practices like indigenous archaeology bridges the gap between the Native American and European American communities that is built by such attitudes. In a film screening about the Columbus Day parade protests in Columbus, Colorado (where Columbus Day originated), it was very interesting to see the arguments that Native Americans made that show how oppressive and wrong these parades truly are. Everything that Columbus Day represents is incredibly offensive to the ancestors and descendants of Native Americans. What Columbus Day stands for is genocide, violence, and dominance over Native Americans. It is interesting how glorified Columbus is today. From elementary school forward, I have learned that Columbus was brave, determined, and heroic. However, in reality, he destroyed the lives of so many people and took their land as if it were his own. This holiday shows disrespect of Native American culture and sends a bad representation of Italian American culture as well. At one point in the film, an Italian American (who is on the Native American’s side of this issue) reminds people that these parades are not reflections of Italian American culture and heritage. There is also the question of “what can we do about this issue today?” This matter is clearly affecting Native Americans currently and we need to ask ourselves what we can do in order to make this better for them. It is an interesting topic because it is more about pride and dominance than anything. Admitting today that what Columbus did was wrong would subject a person to accusations of being unpatriotic and questioning the “pure” origins of the United States. This relates to indigenous archaeology as well because it shows the effect that the past (and our treatment of the past) has on people today. It is important that we respect archaeological sites that belonged to indigenous people because it is still theirs. Listening to these people and actually hearing them out helps us find common ground and decreases the “othering” that is used in the etic approach of indigenous archaeology. When excavating in an area that was occupied by native people, it is important to use techniques that show respect to them. Looting is the exact opposite of the correct way to carry out indigenous archaeology. It shows disrespect and offense to the native peoples. This also relates to the people who put on Columbus Day parades. They are belittling the culture and history of Native Americans and are acting superior to them by celebrating a murderer of their people. If abolishing Columbus Day is not attainable, each side must learn to listen to each other and make compromises in order to begin to respect one another. Victorious. Courageous. Lionhearted. Determined. Heroic. These are words commonly associated with Christopher Columbus, the Italian explorer sponsored by Spain in the 15th century. His daring voyage across the treacherous Atlantic Ocean nearly cost him his life and the lives of all the sailors on board the Niña, Pinta, and Santa Maria, yet it culminated with him “discovering” the Americas and founding the New World. How he managed to reserve the title as “founder” of the New World is truly an enigma. North America had been inhabited for millennia prior, by migrants who crossed the Bering Strait in Alaska to Vikings who sailed from Scandinavia and landed ashore in what is today Newfoundland. Even though archaeological evidence indicates settlements prior to Columbus, textbooks today still attribute the discovery of America towards him; and when he traveled back to America, he spurred on one of the largest genocides the world has ever seen. To refute the common claim of Columbus being the first man to discover America, archaeologists, historians, anthropologists, and students from across the nation have been condemning such history textbooks. 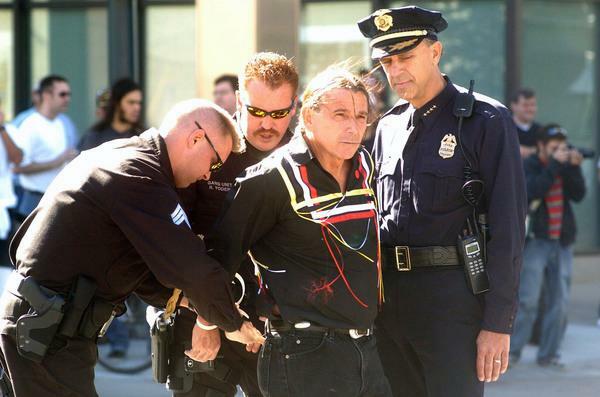 Protests appealing against Columbus Day parades shown in Unsettling Columbus Day views Columbus day from the perspective of Native Americans. This form of anthropology is referred to as “indigenous archaeology”. Indigenous archaeology heavily relies on the perspectives of the native population and uses a more multilinear approach to archaeology in order to gain a more holistic understanding of a society. In a scenario such as the Columbus Day parade, the opinions of the Native Americans play a vital role. Their viewpoints portray a vivid picture of their unified anger towards the celebration of a man who arguably set the ball rolling in the extermination of the vast majority of the indigenous peoples of America. This country was built on opposition – the colonials revolted against the British and resulted in an independent America. It runs today, as a democracy, on debates in the Senate and judicial system. As a nation, the very concept of being able to stand up for one’s own rights and having an individual voice is fundamental in its constitution. Unsettling Columbus Day displays that very sentiment by showcasing various stances taken by Native Americans on Columbus Day. By utilizing indigenous archaeology, the movie is not only able to bring about different perspectives, but also emphasize emotions and therefore connect with the audience. As a grade-school student, I learned very little about pre-Columbus history of the Americas. Even in AP US History, only one chapter out of 30 described the natives that lived undisrupted before European settlers moved in. The story in itself is completely one-sided. Though many Americans celebrate the day in remembrance of a great navigator, they remain unaware of the atrocities Columbus’ travels brought to the natives. By ignoring the other, negative side of what Columbus accomplished, the American celebration of this day legitimizes such a conquest. The importance of rewriting the story relates to the indigenous archaeological approach. Indigenous archaeology uses the study of past human activity in a way different from older techniques. Focus is placed on deconstructing colonization frameworks and bringing cultures in the margin to the center. A key piece of this approach is to involve the culture being studied, thus giving agency back to the people while studying a culture in a fair, nonjudgmental way. The movie Unsettling Columbus Day attempts to study the national holiday from multiple perspectives. Though material culture is not necessarily addressed, the voices of Native Americans is brought forth to the center and discussed. A very effective part of the film also discussed the importance of the holiday to Italian immigrants, as Columbus himself was Italian. This holiday, for Italians, celebrates a Euro-American origin story, as Italian Americans were treated poorly, as well. The question then becomes, is there room for two minorities? The indigenous archaeology approach is very suitable for such a question. Decolonizing the past does not necessarily mean replacing one majority group with another. Instead, balancing all the voices of the past and listening to many sides of a story. Due to the horrible actions committed by Columbus, many can relate his story to that of current terrorism. Others who celebrate the holiday do so with a sense of pride in America and Italian heritage. The issue lies not in celebrating the conquest of Native Americans, then. The name of the holiday itself implies that America condones what happened many years ago. Compromise must be made on what exactly is being celebrated and accepted by the American culture at large. It is of the utmost importance to keep in mind all sides of the story, as well as give power to those who deserve it the most. To construct a more equal future for all, rewriting the history is necessary.